Out on my run the other day at Ocean beach- spotted these discarded plates lying beside the trash can on the path. Hmm, I wondered if someone would toss out their handmade plates as they would these fabricated cookie cutter plates...doubt it. 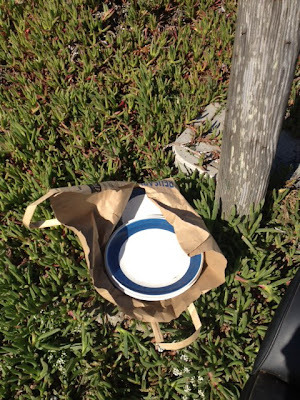 Would someone use their handmade plates perhaps for a beach picnic and think-'oh, I'll just toss these and get some more next time'..don't think so. And it got me thinking about how I have transformed my tiny studio into a factory of sorts lately working day and night to produce a line of tableware for a large order due in March, and how while I am pumping it out and when I look around at the plates teetering on top of bowls and makeshift shelves...studio walls bursting at the seams, I realize that I, too have temporarily become a factory. But the big difference is that I am cutting, rolling, sponging, carving, sanding, firing, glazing, firing again, packing--all by myself. Now mind you- this is exactly the kind of sweatshop that Edith Heath worked to overcome in her evolving Heath ceramics. 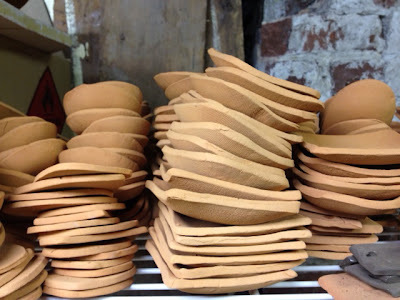 She thought that there should be more automation for the studio ceramicist to remove some of the toil and sweat but still produce a hand touched product. I agree there is a place for that and totally champion her for her aesthetic and work ethics, but I love doing this the way I am. Yes, I may never rub out the brown clay from inside my fingernails (a badge of honor! 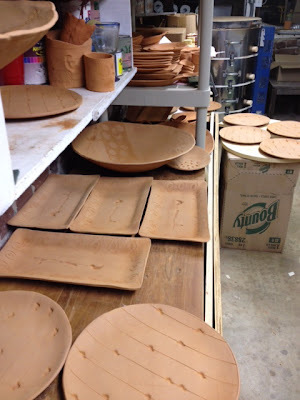 ), and my lower back has lost all feeling..but putting in this work on each individual plate that will soon be distributed around the country- is kind of thrilling.